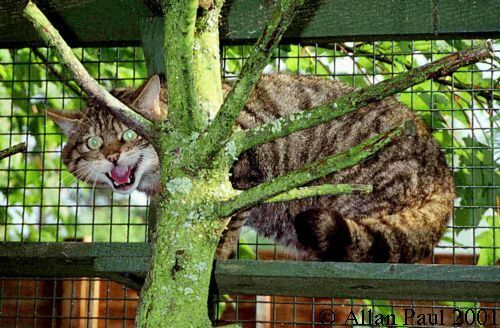 CONSERVATION efforts to protect the Scottish wildcat are "misguided" and a waste of time, experts claimed yesterday. A joint study between Oxford University and an environmental agency in Darwin, Australia, found that interbreeding has made work to retain both the wildcat and the dingo as pure-bred creatures pointless. Wildcat enthusiasts, however, have reacted furiously to the claims in New Scientist magazine. The researchers said interbreeding has occurred since domestic cats first appeared in Britain about 2,000 years ago, leading to a split in the wildcat population. One wildcat group now resembles the domestic cat, while the other retains the typical wildcat features of stripes and bushy, ringed tails. Experts said the differences between the two groups of wildcats and domestic cats is now less than those between most breeds of dogs. Laurie Corbett of Earth-Water-Life Sciences in Darwin, said: "You can't bring pure-bred cats back. That would be like bringing back dinosaurs." But Dr Terry Moore, the director of the Cat Survival Trust, said: "While at least half of Scotland has seen a lot of interbreeding between wildcats and domestic cats, there are still a lot of areas where the wildcats are isolated enough to keep them distinct."